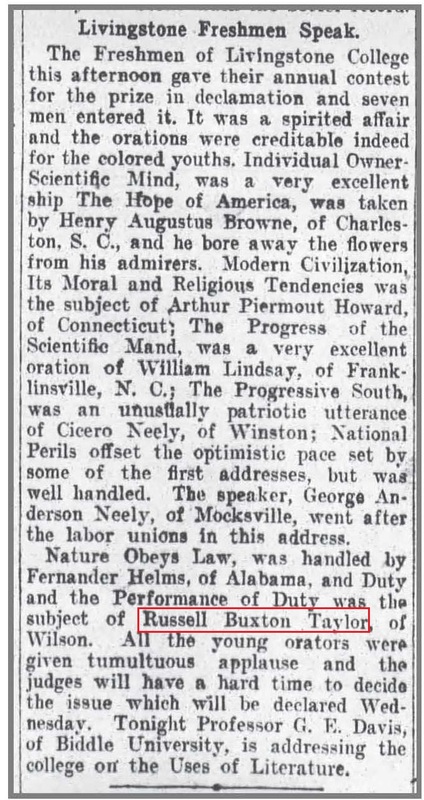 Greensboro Daily Industrial News, 29 May 1906. 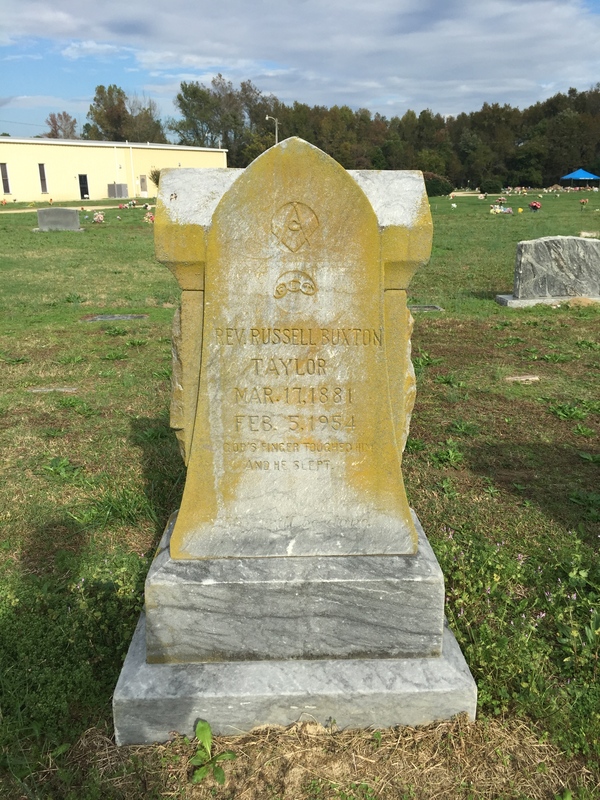 Russell Buxton Taylor, born 1881, one of five children of Jordan Taylor and Mary Jane Bass Taylor Henderson Sutzer. According to an entry in History of Wilson County, North Carolina and Its Families (published in 1985 by the Wilson County 130th Anniversary Committee) written by his daughter B.T. Barnes, Taylor worked as wood hauler and tobacco warehouse laborer before leaving Wilson to attend school at Slater Normal School in Winston-Salem, North Carolina, then Livingstone College. While in Salisbury at Livingstone, he met Viola Elaine Gaither. They married in 1911, and their children included Beatrice Taylor Barnes, Lauraetta Janet Taylor, Sarah Gaither Taylor McMillan, Christopher L. Taylor, and William Goler Taylor. Rev. R.B. Taylor registered for the World War I draft in Charlotte, North Carolina, in 1918. He reported that he was preaching at an A.M.E. Zion church in the city. The Taylors returned to Wilson in 1927. Rev. 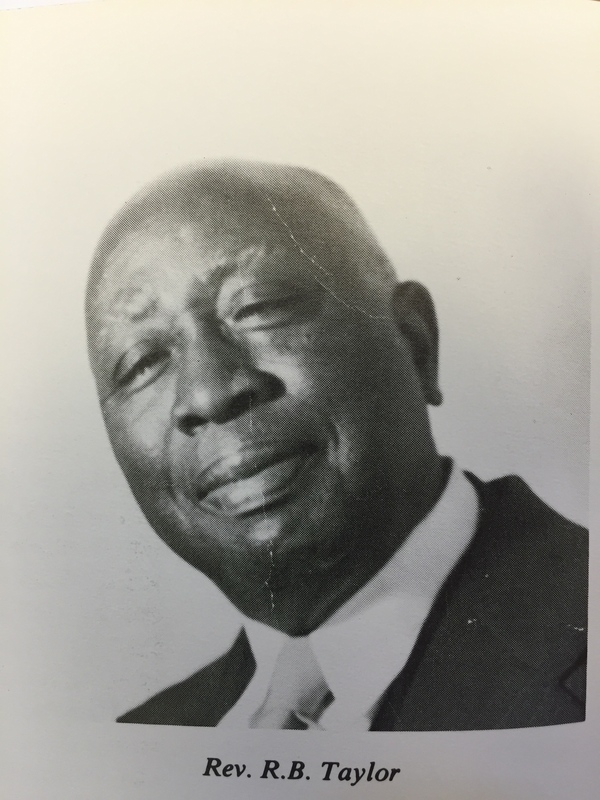 Taylor taught for sixteen years at Carver High School in Pinetops, Edgecombe County. Photo courtesy of History of Wilson County, North Carolina. “God’s finger touched him and he slept.” Masonic cemetery, Wilson, November 2015.